Finger pointing comes easy when the blame game comes into play. It is definitely chic to point the other way when all fingers are pointed at you. Blaming someone else for a mistake is not something new. In fact, it is a time-honoured habit which we picked up when we were young. No one worth his salt can deny this. We are all guilty of being an accomplice in the complicity. It may not mean much if the outcome merely affects one victim, as there is recourse for a redress. However, if it affects the community as a whole, then there is reason for a re-look at policies implemented. The last couple of weeks have witnessed some very interesting developments taking place in the city. 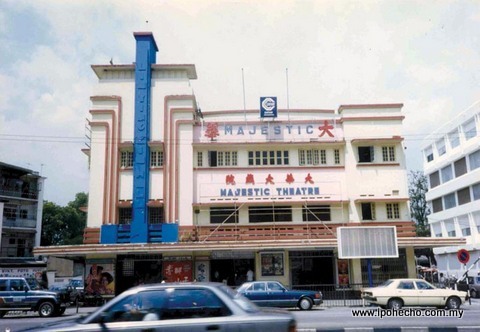 Foremost, is the unwarranted destruction of a declared heritage site, the iconic Majestic Theatre, once an important landmark in Ipoh. Crafted by renowned Danish architect, B.M. Iversen the building was pulverised for no rhyme or reason other than to make way for a building project. The insensitivity of some is puzzling, to say the least. Don’t they consider heritage the same way they keep their bank account balanced? Or do pecuniary rewards far outstrip aesthetic values? These people do not have an iota of conscience left, otherwise they would not have done something so despicable. That is on the part of the new owners. To them owning a piece of real estate means they are at liberty to do whatever they please. What is more disturbing is the reaction of the authority, in this case, Ipoh City Council. A local council that prides itself in acquiring ISO standards should not be so callous as to allow a private entity to do whatever its heart desires. It is tantamount to subverting the public’s trust in the council. Must it be construed as such? Last week one lingering problem was resolved with the timely intervention of a senior politician. Flash flooding in Taman Lapangan Ria is pervasive and has become a bane with residents of the housing estate. The problem was introduced by an irresponsible developer who decided to jump-start his project without considering the well being of the nearby residents. His poorly designed retaining wall, ill-conceived drainage system and misplaced sewage pond caused havoc to the Taman Lapangan Ria residents. When the residents’ complaints fell on deaf ears they decided to take it to the state government. That was their final salvation. Senior Executive Councillor, Dato’ Hamidah Osman was all ears and through her efforts the problem was amicably resolved. Does it need someone high up to intervene when it could be settled with a little imagination? Is this apathy or a case of selective persecution by the local council? We can say so of our Judiciary, the Anti-Corruption Commission, the Police and lately JAWI (Federal Territory Islamic Department) but Ipoh City Council? Hello, Ipohites need your help, as our money is keeping you afloat! Has the council taken the path of no return? Heaven forbid if it does. It really does not surprise anymore about how and what city hall does anymore. The double talk, the excuses and a total lack of appreciation of how Ipoh once was. Yes it was a chinese mining town that was propogated by the British and yes, it once had more millionaires per square mile than Texas. The serialised erasure of this unique identity and the introduction of the mediocre trivial aesthethic upgrades has been ongoing since a supreme race culture was first raised in the courts of power of the land. Removal and eradication of what was in an effort to re-engineer the minds of the populace. It will only succeed when the last of those who remember the glory of Ipoh is dead and gone. A lone voice is always easier to quell and ignore, no matter how relevant. So the downward spiral has already begun, as is evident from articles that have appeared in the Echo. The loss of much of the heritage Ipoh once held is now further being decimated one at a time, all for the glory of the present, with no regard for its roots or its rich past. Sadly, there are those who profess worldly wise broad minded approach to development but are incapable of realising the value of history and heritage and enjoy living within such confines. The chase for fame, glory and recognition starts from what we have and how we can capitalise on it for our future. It is a “state mind” quality that the new generation cannot yet understand. They cannot be blamed as they haven’t had the benefit of getting educated on this experience . Their children’s children might but not they who live in the “now”. The State of City Hall befuddles my simplistic mind. It is after all led by some of country’s finest bright minds but who lack soul, perhaps a tinge of integrity and maybe a slight touch of misplaced priorities. That should please a few of those some of whom I have described above. Anyone reading this and interested in the demolition of the Majestic Theatre should also go to http://ipohecho.com.my/v2/2012/07/01/developer-ignored-mbi-stop-work-order/ on the back page in the same issue of the Echo. It is an appalling story and one wonders just who does this developer think he is to have the right to act in contravention of the law and against the public interest and safety.